Private Garden VisitingStill Too Many Roses? After a serious flirtation with rhododendrons and camellias I am back on track. 2005 is going to be the Year of the New Zealand Native. There is to be no more pulling out Pittosporum seedlings, or ignoring Hebes on the nursery sale table. Foliage followers will wonder why I ever left the Native fold. Forget flowers for a minute and compare gloomy camellia leaves, or (even worse) tatty, spotty rose leaves with the shining leaves on the New Zealand native Coprosmas, Corokias, and Pseudopanaxes. These have beautiful geometry, wonderful texture, interesting colours - and no bugs! Very generally speaking, New Zealand Natives are evergreen, and subtle in flower, with a lot of cream, white, and yellow. Flowers tend to be small. According to my reference book approximately eighty percent of our plants are found growing wild in no other land - this is a very high degree of endemism, apparently. It might be a good idea to actually do some reading and research from this worthy book! New Zealand Natives are perfect to grow in mixed planting schemes. Plants like the small coloured hybrid flaxes add warmth and style to my garden, as they would to any garden - from cottage to minimalist. Let's hear it for Renga Renga - a native which I have always loved, and often totally ignored. Many years past I've broken up older clumps to create many new plants - I can use all the Renga Renga I can get. I grow it under trees, and along edges of sheltered paths. Seedlings are potted up and nurtured. Renga Renga is my mass-planting ideal. It grows well in dry shade. Renga Renga can get frost burnt, so it's tidier if grown in shelter. The botanical name is Arthropoduim cirratum - when I first saw this plant I heard it called a 'Rock Lily'. 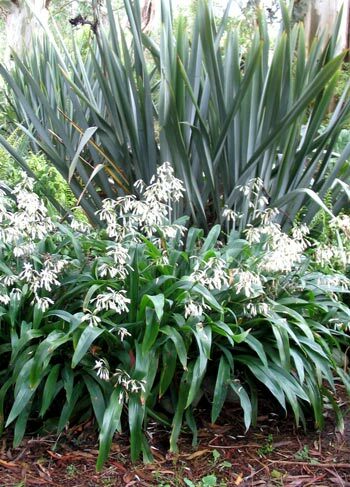 It's also known in gardening circles as the 'New Zealand Agapanthus' In other words, instead of mass planting South African Agapanthus, why not choose New Zealand Renga Renga? I never deserted my New Zealand flaxes (phormiums) though. Even when the lure of the rhododendron nursery was at its strongest, I kept the faith. 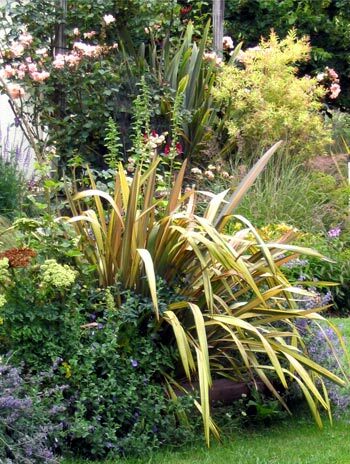 My flaxes are everywhere - from the stiff tall Phormium tenax species by the water race to the cute little knee-high hybrids spilling over their neighbouring plants like small fountains. I think there's a little red-toned flax in almost every garden area. Olive drab, clear green, cream, dusky pink, rusty reds - I have all colours, too. My latest flax is super stylish with a label shaped like a wine bottle and the name 'Merlot' - it's a deep dark wine red colour. Connoisseurs, be very impressed! All sorts of New Zealand Natives look good in pots. I've done the 'Silver Astelia in Large Blue Glazed Pot', and the 'Divaricate Scribbly Shrub in Trendy Terracotta'. New Zealand bush-walkers (trampers) have seen armies of Aciphylla (ouch!) and mountains of Matagouri (aargh!) 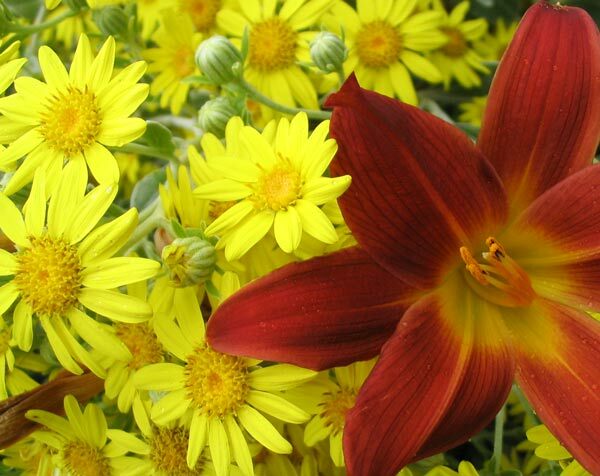 - even these two thugs have made it into trendy courtyard gardens. Not the most pleasant of shrubs to meet in the night, though. Hurray for Hebes and Pittosporums! They fill up space, mind their own business, and make a beautiful foliage background when required. They flower at all times of the year. And they boldly grow underneath greedy Australian gums and wattle trees. I also have a potential Hebe and Pittosporum forest growing near some large pines - go, you good things! 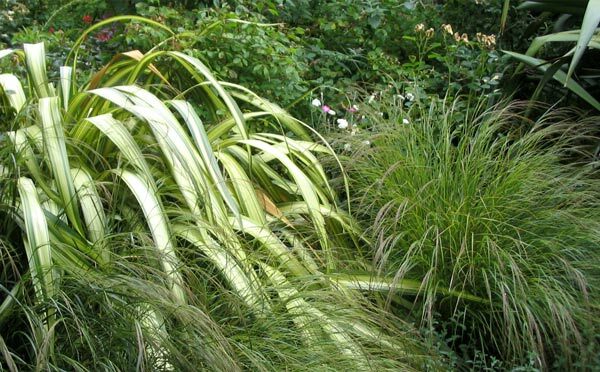 And look at the contribution to shapely garden interest made by the New Zealand spiky shrubs and trees - prime examples are the Cordylines (stylishly variegated, deep red, or just plain green), the big plumed grasses like Toe Toe, and the little bright orange spikes of Libertia. What a variety - a spike for every occasion! Bring on the New Zealand Natives! The Moosey garden is on a river flood plain which is prone to drought. 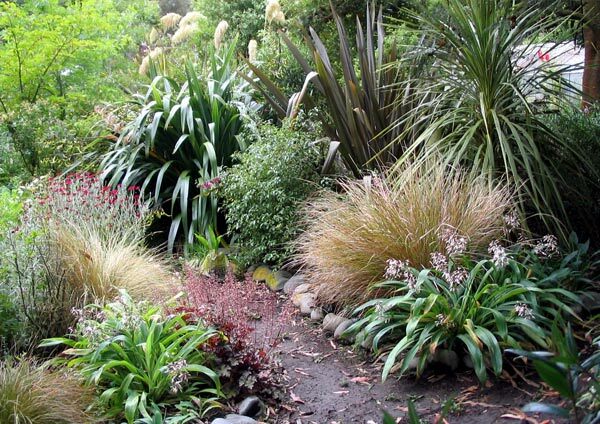 The only New Zealand Natives which would naturally have been growing here are native grasses. Private Garden Visiting	Top Still Too Many Roses?